With humor, chutzpah and a piece of vinyl siding firmly in hand, Peabody Award-winning filmmaker Judith Helfand and co-director and award-winning cinematographer Daniel B. Gold set out in search of the truth about polyvinyl chloride (PVC), America's most popular plastic. From Long Island to Louisiana to Italy, they unearth the facts about PVC and its effects on human health and the environment. A detective story, an eco-activism doc, and a rollicking comedy, BLUE VINYL puts a human face on the dangers posed by PVC at every stage of its life cycle, from factory to incinerator. Consumer consciousness and the "precautionary principle" have never been this much fun. "Funny and irreverent! One of Sundance's best documentaries." "Blue Vinyl is a kind of ecological detective story that provides humor along with information...[a] strongly recommended addition to school, college, and community library collections." "That rare muckraking film with a sense of humor." "Directors Helfand and Daniel Gold brilliantly link unlikely stories and characters across continents, race, and class." Caroline Libresco, Sundance Film Festival. "The Green Building Movement may have just acquired its first cult film." "Blue Vinyl hits your psyche like a ten-ton brick. If you care at all about the future you'll see this film." "Blue Vinyl is highly recommended for upper level high school students, colleges and the general public. School media centers, college/university libraries and public libraries would benefit by having this video in their collections." "The kind of movie you could name an ice cream after." "Kudos to Helfand for her five-year struggle to get her parents -- and us -- to see the light." "This excellent documentary is well-filmed and edited. Helfand and Gold have used some very interesting techniques to capture the story...Sound is excellent and choice of music is eclectic. [Blue Vinyl] supports any number of inquiries into the role of science and industry in our global society." "An amusing and irreverent but also resonant exposé...Entertaining in its sardonic style...Blue Vinyl allows the industry its rather laughable say, but presents a scientifically persuasive case that PVC chemicals are now getting into the atmosphere, groundwater, and the food chain. Recommended." "Blue Vinyl...is alternately hilarious and disturbing...Helfand's style of filmmaking is similar to Michael Moore's, except that she is less confrontational. 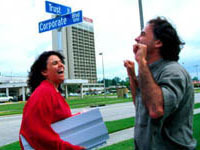 When interviewing corporate executives, she incorporates a subtle, naive approach to tease out self-incriminating statements...Incorporating animation into the film is not only creative but also educational...Although it is not your typical film used in anthropology classes, its emphasis on environmental issues and community activism are very important. Showing examples of corporate culture and raising the issue of corporate social responsibility (or the lack thereof) are also important points of discussion for the classroom. Considering the ever-increasing number of business majors in the university population, it would be a very important film for both undergraduate and graduate students." "Funny and unpretentious... It brings up honest questions, such as where this product came from, why we are using it, and if we don't want to use it, what alternatives are out there. Most people feel that on some level there is something wrong with vinyl siding, but not everyone knows why. This film exposes the fact that vinyl siding is, in every way, a hollow product." www.bluevinyl.org Learn more about Blue Vinyl and the filmmakers. Endocrine disrupting chemicals damage reproductive organs and cause learning disabilities. Examines the alarming levels of pollutants inside our homes and suggests ways to reduce them.